Gov. Brown vetoed the measure that would have allowed nightclubs to serve alcohol until 4 a.m., leaving San Francisco bars dispirited. Late-night party people who had hopes of drinking longer at the bars were served a shot of bad news Friday. Gov. 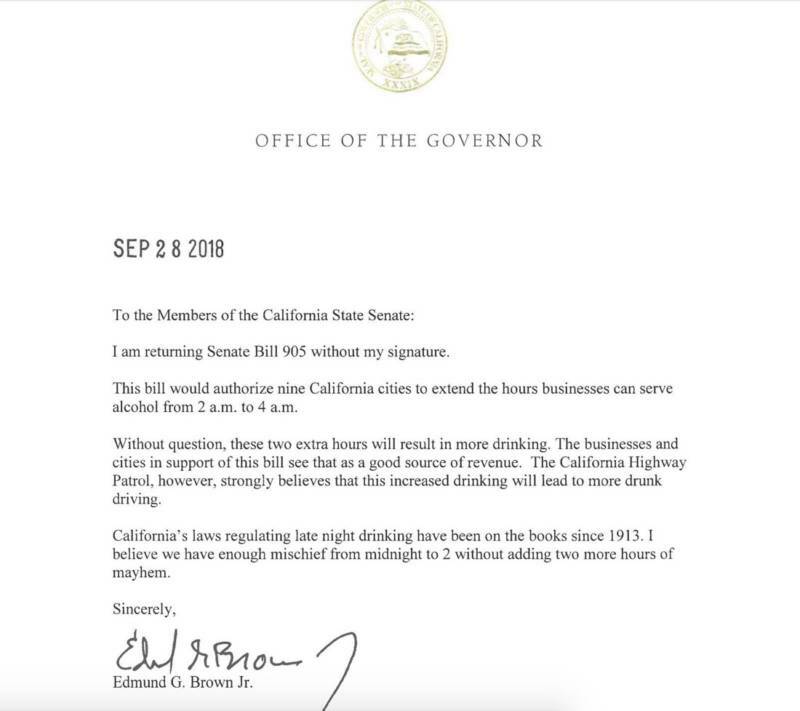 Jerry Brown vetoed a bill that would have extended last call until 4 a.m. in certain communities. If you think this gives you a case of the bitters, imagine how the late-night bars feel. We get some idea what Brown was thinking from the statement he released after vetoing the bill. “I believe we have enough mischief from midnight to 2 without adding two more hours of mayhem,” Brown said. Sen. Wiener, the bill’s author, put out his own statement saying, “It is a shame that we will continue to stifle our nightlife economy, but I remain committed to modernizing these outdated laws.” He also promised on Twitter that he would reintroduce the same bill in next year’s session. That may be little comfort to bars like the DNA Lounge, which flirted with the idea of closing in 2016. They remain afloat in part thanks to a DNA Lounge Patreon campaign, which you might want to contribute to if you don’t want their next last call to be their last.